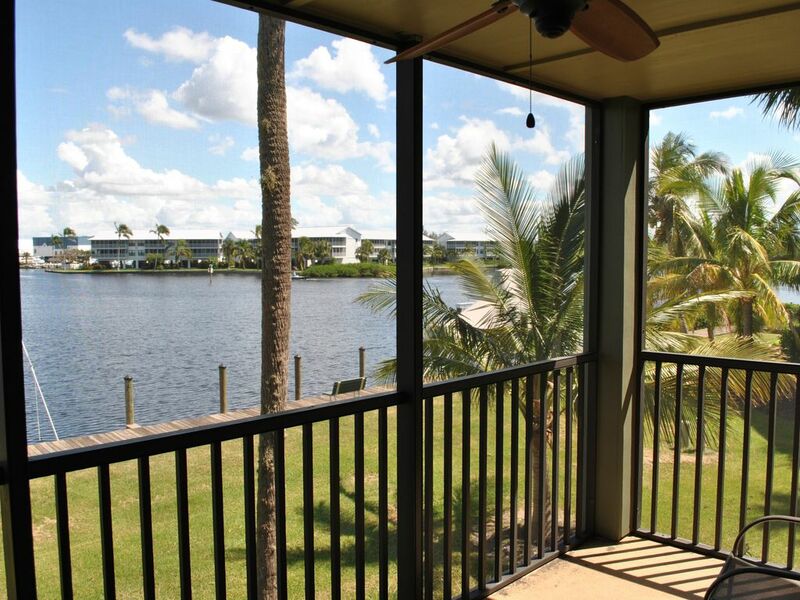 Waterfront Townhouse - End unit with boat slip! One of the nicest units in Bocilla Island Club!! Beautiful waterfront end-unit condo with boat slip on the northern tip of Pine Island on Charlotte Harbor...minutes from Boca Grande Pass and the beaches of North Captiva and Cayo Costa! This unit boasts one of the best locations and views in all of Bocilla Island Club! Additional information at www.pineislandgetaway.com. A perfect location for boaters and fishermen - Boat slip available in front of unit! Nestled among coconut palms and mangroves, your 'Pine Island Getaway' sits on the quaint, tranquil northern tip of Pine Island. Part of the Bocilla Island Club, this property is your destination for those who treasure the beauty of nature and the uniqueness of 'old Florida'. This townhouse is an end unit and sits on the water, with beautiful views of Jug Creek - only a short boat ride from famous Boca Grande Pass and the pristine beaches of Cayo Costa. Enjoy beautiful sunrise views, with seabirds, dolphins and gentle breezes from the screened lanai. This townhouse has been recently remodeled, featuring tile throughout the first floor and Berber carpeting on the second level. The first floor features a large living/dining area, newer appliances in the kitchen, half bath and a large screened lanai. Upstairs is the master suite, with a king bed, walk-in closet, full bath and screened balcony. The second bedroom includes one queen and one single bed, with a full bath. The upstairs also has a full laundry room. Below the building is covered parking and a locked storage room for bikes, fishing gear, etc. Dock available in front of unit with water and electric at slip. Boat ramp also on property. The property also has a kayak rack and launch area with stairs to the water - within ~30 yards from the unit (very close). This is a very tranquil 'get-away' with great fishing and boat access to the best beaches in the state! Kayak Rack and Launch area with stairs to water. Great place for the family and fishing. We really liked our stay. Location is great. We went fishing everyday. We were picked up on the dock right outside by my in-laws. Kitchen was well furnished. Very clean. There is a storage room downstairs by your parking spot. It was very helpful. Our only issues were the couch bed was very uncomfortable even for a couch bed. I would not count on it for a place to sleep. Also, the AC could not be turned down past 75, but I was told that was being fixed, so it may not be an issue for long. I would highly recommend staying here. Great view, Clean unit, no bugs, well equipt, what more can you ask for? We are four seniors who love to fish and what a wonderful location for that, Bokeelia, Fl. It's a short distance along Jug Creek to great fishing in Charlotte Harbor. If you are looking for deep water fishing simply continue on to Boca Grande Inlet and out into the Gulf. This apartment is clean, all initial supplies for bath and kitchen are provided and not one bug seen in the unit during our entire stay. The apartment furniture and beds are comfortable and in good condition. Auto and boat parking are very convenient and the extra storage area located at the vehicle parking spot works well for storing fishing poles and etc. We are so pleased you enjoyed your stay! Thank you for your kind words about our condo - the fishing has been great during late summer! Great to hear that you found our place as comfortable as we do! Great place to stay. We enjoyed it thoroughly! We had one minor problem. We left some food out on the kitchen counter one night and there were sugar ants on it the next morning. Thanks for the great review! We are glad you enjoyed your stay. During Summer months here in Florida, we do sometimes have challenges with sugar ants if food is left on the counter...we are sorry these little critters were bothersome. We have quarterly pest control, and supplement this with sugar ant bait traps that generally work well. We'll make sure we leave a stock of traps and sugar ant gel in the kitchen drawer just in case the ants decide to return. Beautiful location, condo was clean, appropriately equipped and within easy drive of super beaches. Condo grounds are beautiful, quiet and feel private. This unit was very clean and adequate for the price. We stayed here for the Thanksgiving holiday and what a great choice! The area was quiet and the condo was perfectly appointed with everything a person needs; games, books, wifi etc. The view is amazing! We rented a boat from Four Winds marina right across the water and it was fun to see the condo as we idled out to the harbor. The pier across the street for Bocilla stretches out into the Charlotte Harbor and we got some beautiful pictures of the sunset, and there was even a porpoise that swam by! Right down the road at the end of the island we were able to rent kayaks which was very convenient. The condo itself is so spacious, and very comfortable! We would absolutely stay here again!! Wonderful to hear you enjoyed your stay! We would love to have you return and offer return renter discounts! My husband and I traveled to Pine Island for an anniversary celebration and to do some fishing. We found the condo to be just what we were hoping for: the accommodations exceeded our expectations and was very comfortable and quiet. The kitchen was well equipped and had everything we needed to cook some great dinners. We liked having an upstairs and a washer/dryer. Its location to the marina where we rented our boat couldn't have been better - just across a small bay - and having a slip right there was so convenient. Although the temperatures outside were in the 90s with high humidity, we were instantly cooled when we got "home" after a long day of fishing. The owners were really easy to work with and they answered all of our questions before we booked. Everyone we met on Pine Island was very kind and helpful. This was a wonderful getaway for us, and we look forward to going back (maybe when it's not so hot! ).